Celtics co-owner Wyc Grousbeck (left) joins in the applause for Robert Kraft. The question of how sports fans would react to the prostitution scandal involving New England Patriots owner Robert Kraft was at least partially answered Sunday night. 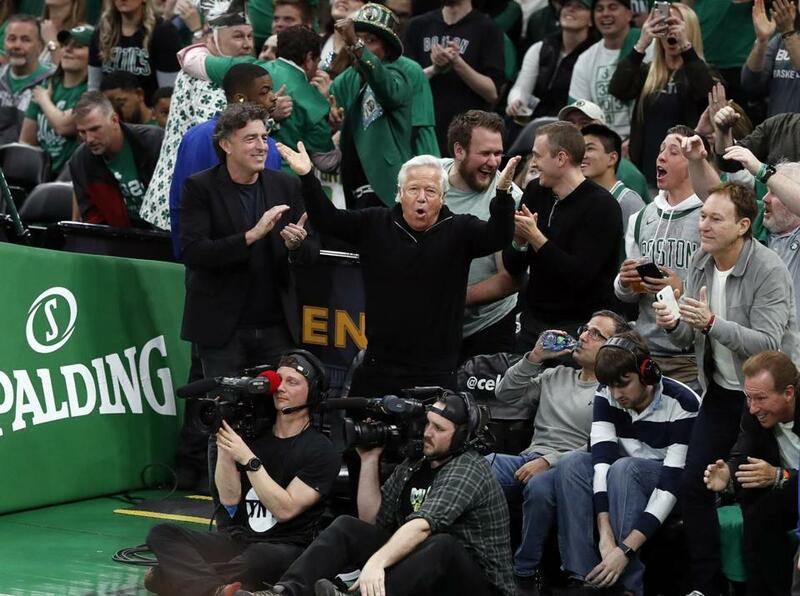 Kraft attended the Celtics’ playoff game, sitting with Celtics co-owner Wyc Grousbeck, and received a loud ovation when he appeared on the video board. Video showed Grousbeck standing up with Kraft and turning toward him, clapping. Kraft pumped his fist, waved and joined in the clapping. Fans behind him stood up and clapped and took video; one man sitting to the right did not. Kraft’s appearance on the board immediately followed one by Celtics legend Larry Bird. Kraft, the 77-year-old billionaire owner of a sports dynasty that has won six Super Bowls since 2002, including one earlier this year, faces two misdemeanor counts of soliciting prostitution at a Jupiter, Fla., spa in January. Adam Himmelsbach of the Globe staff contributed to this report.